I have always loved topiaries! I have decided it is time for me to channel my inner Bunny Mellon and try to grow some of my own. Until now, I have had ivy, Eugenia and several fake ones, but after seeing the Myrtle in several magazines I was smitten. However, when I began to search for them I realized two things: they are hard to find and once you do fairly expensive. So I couldn’t help myself when on a mission for something totally different at local nursery (Ellenburgs), I spied some tiny topiaries of the Myrtle variety. They had started them a year ago and were very honest with me that they could be difficult to keep alive. I was up for the challenge and purchased the two cutie pies pictured below. They were not cheap at $39.95 each, so I decided to do some research. 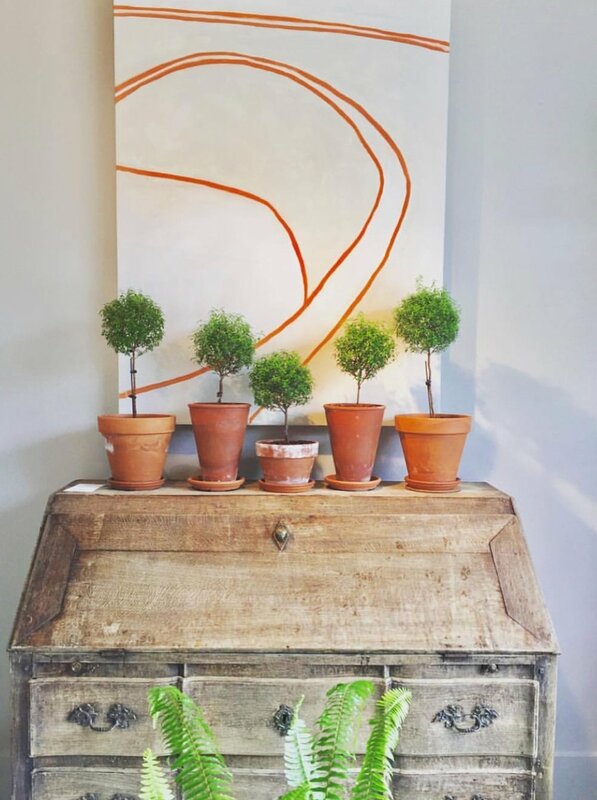 According to the experts at Snug Harbor Farm: “One of the most common questions I seem to get from both novice and experienced gardeners alike this time of the year is “How do I keep my myrtle topiary alive indoors through the winter?”. I will admit they can seem a bit finicky, but just like any houseplant, all they need is the right balance of sunlight and water to sustain their growth. Well, that’s the short answer, anyway.” Click on the link above for the full article. Doesn’t sound terribly difficult - right? My topiaries are currently 12” tall and have benefited from this warm spell we have been having. Hopefully with a little luck, I can keep these sweet plants going. I would appreciate any tips or words of wisdom you have - please share! I will check back with you in the spring to let you know how they are doing. You can also purchase several different varieties at Snug Harbor Farm. Special thanks to designer Heather Chaddock for allowing me to use some of her beautiful and inspirational photos. For a real treat, check out her work and gorgeous textile collection at Heather Chaddock Textiles. Check out this link to AD article about Tory Burch’s South Hampton home. The entry hall filled with topiaries is pure perfection! The Gardens of Bunny Melon by Linda Holden is not only a beautiful book, it’s also a great source of inspiration for anyone who appreciates horticulture.